Had a lie in today until 10pm, dropped some laundry off and went out to get some lunch in the town. At 1pm we met up with Anne (mother of Welsh family) and got a bus to the Floating Village. As we got there it started to rain; which was ok as we had a roof on the boat. The driver took us 8km down the river to the village itself which is on the lake. When we got there we were taken to a shop to look around, followed by the local floating school where we met the teacher and he told us about how the school works. After leaving the school we went to a small crocodile farm where there were about 20 crocodiles in caged areas of the lake; used for their skin and meat. At this point, two kids came up to us with snakes around their neck and let us take photos with them. We saw a crocodile skin too. After this we headed back to our bus in heavy rain. When we got back, we went to pick up our laundry and went to the night market for some crepes, gift shopping and shoulder massages which were $2 for 15mins. This would be our last night in Cambodia. We were up at 7am to get a bus to the border of Thailand, this took about 2 hours. We crossed the border all ok, and set off on another 5 hour journey to Bangkok. To keep ourselves occupied everyone on the bus were playing one game of Uno with playing cards. We stopped off at some services and I got a microwave pizza slice for lunch. We arrived in Bangkok at 3:30pm to another rain storm. After the storm died down we took a walk as a group to see what was about. We found a McDonalds and Burger King, but chose not to use them. The McDonalds sold 'Tuna Pies' instead of Apple Pies. That night we ate out with another tour group who were going the opposite way through the countries to us and played some pool with Simon (welsh). We walked back to the hotel after this and Simon booked himself in to get a tatoo done as they were cheap here. Him and his sister Vicky both have tatoos and Vicky booked in to get one done on Sunday. Today the two girl from New Zeland left the group and went on their own way around southern Thailand, they left at about 7am so did not see them. We were up at 10am to go to the bank to get some money out for trips; this was for an evening show called Siam Nuramit which is the biggest show in south east asia.Once this was booked, we met Anne and Vicky to go on the river boat taxi down the river to the grand palace. Myself and Andy would be going into the palace next time we are in Bangkok, but Anne and Vicky were leaving the tour on Monday so would not have the chance to. When we got there we got on a TukTuk to go to some other sites and we were told the palace was closed until 3pm, so we got on and the TukTuk's would take us to 3 stops of sites in Bangkok, they took us to a temple first, but after this they took us to a Jewelery shop as they got petrol vouchers for just taking us there, which we agreed on doing as it was just the one stop and we looked around the jewelery shop. After leaving this shop, the driver said he'd take us to the next site; however half way there he pulled up and said he wanted to take us to one more jewelery shop for petol, at this point Anne and Vicky started shouting at him, and agreed that we would go, but if they tried any more we'd walk off and not pay them. This jewelery shop let you see the factory part and cutting the stones, so it was not too bad. We left this store and went off to one site we wanted, as we were running out of time for the Palace, but on the way there, yet again, they stopped and said they wanted to go to a Silk shop; so vicky just got out and dragged us out and we started walking off, so the tuktuk drivers said they would take us back to the Palace, and they did. It was annoying, but a funny experience watching Anne and Vicky shouting at the tuktuk driver. They finally got their look in the palace once we got back; which turned out to not be closed at all during the day. 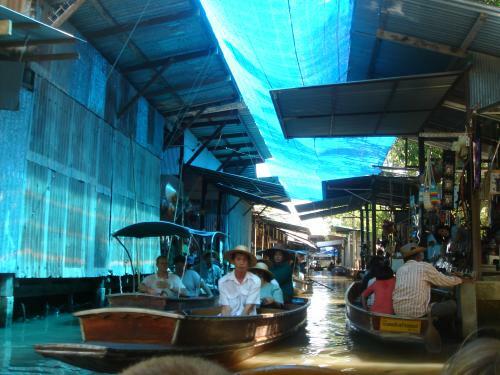 We headed back after they had finished looking and booked a trip for tomorrow; the floatng market. Then we headed out to our show at 6pm, as you get there, there are elephants outside which you could feed and ride, I did not ride one here as we would be doing it later in the tour, but the 3 welsh did. We then went to get our buffet meal which was good, and then sat to watch the show. It was very well done, it had rain falling in it, and deep pools of water which seemed to appear from nowhere, there were also elephants and goats used in it. After the show, we went back to meet Sarah and some of her friends who were travelling at the same time but with other people and sat in a pub/bar for a few hours and watched some kids break dancing in the street, and a guy building towns of bottles like you'd do with playing cards before heading home with 7 of us in one taxi. We got up at 6am to catch a bus with Blane and Chrissy (Canadian) to see the floating market. It was a good experience but very busy. Bought some bits and pieces here before going on a boat through some coconut and mango farms. We got back from there at 1pm and had some lunch. A new person is joining the group today for the rest of the trip but no one has seen them yet, they are apparently from Northern Ireland though.